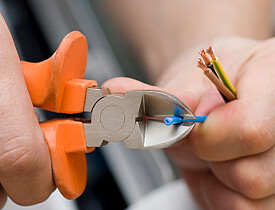 Finding the right electrician can be as much a matter of safety as getting your money's worth, since electrical problems are among the leading causes of house fires. Electrical work must be done by the book -- specifically, the National Electrical Code book -- and follow all code requirements of your city's building department. Asking these 10 electrician questions will help you find a qualified pro with the right experience and business practices for your needs. 3. What kind of work do you do most? A permit ensures electrical work will be checked by a city inspector -- an important safeguard for homeowners. It's standard for electrical contractors (not homeowners) to pull permits. 8. Who will perform the work? Learn how well a pro stands behind his electrical work. Also be aware that electricians typically assume responsibility for fixtures, devices and other equipment they buy for you through their professional accounts. switch boxes that sit squarely and finish flush to the drywall surface, etc.